Usually, the idea of travelling around the world is very expensive which prevents a lot of people to start travelling. They always get discouraged and think that it might be too expensive and hard and they won’t be able to do it. But travelling in general is not as expensive as it seems, especially if you have a job. There are many ways in which one could work and travel at the same time. Moreover, it is not as hard as imagined and it is usually overlooked by travellers and workers alike. Travellers should find jobs that are temporary and they should finish it so as to get capital and resources for the rest of their trip. Be creative and be specific of what you can offer with your available knowledge and power. 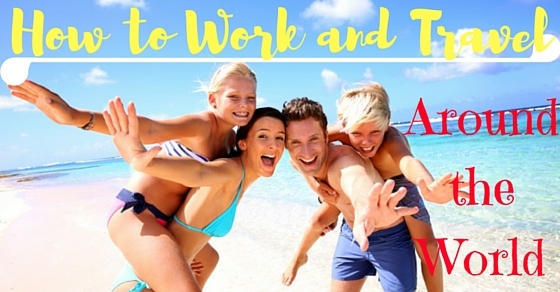 The following mentioned are few tips to work and travel around the world. This is one of the easiest methods for native English speakers. A large number of jobs related to teaching are present in many parts of the world, especially in developing countries and in South East Asia. They usually provide a good wage per hour for teachers, have flexible working hours, and the jobs are really well paid and give good bonuses. It is a really good experience for first-time travelers since the hospitality, food and the people are really great. Moreover, these kinds of jobs are not restricted to just English only. These jobs also apply for languages such as Spanish, Italian etc. Try to make sure about the seasonal works and their availability, such works include jobs at ski resorts, bars, camping guides, tourist guides, and boats and such. Make sure you search for the job well before the season starts as such kinds of jobs are really in demand as they pay really high. Wherever there is a bog tourist destination, there is a high demand for such jobs. If you try to search for jobs mid-season, such jobs will be really hard to find. If you have a really good background in technical knowledge such as designing, programming, and web services or anything tech related, there are many websites such as Elance and such where they provide virtual services for freelancers which also provide a chance for travel around the world. Just try and pick up a job that is suitable for you. Though this type of work is really competitive in nature, but if you have a good portfolio you might get a lot of chances for such jobs. For example, there are a lot of freelance consultants present using the Elance site. Even if you don’t have the necessary tech skills, try to find jobs specialized in research. Task rabbit and Fiverr are also good sites for finding online jobs. This a good method to get a good paying job, while getting a chance of travel all over the world, gaining some work experience and get to know people from different nationalities. Many of these jobs are present in developing countries and are usually less paying. There are many jobs to choose like this. For great references, blogs such as the wandering earl are of great help. Countries like Australia, New Zealand, Canada and Norway provide working visa for individuals to those who are less than 30-year-olds. A working holiday visa allows you to take jobs in any country that you visit. It is usually a work permit that allows outside jobs. The jobs are usually temporary and seasonal. For example, BPO jobs like working at call centers. To find such jobs try searching for the local job boards present in such countries, or try asking the place of accommodation that you are staying at. In countries where many working visas are prevalent such as Australia or Norway, they usually have job boards just for this specific purpose. This can lead you in having a suitable job. This also provides you a opportunity to travel and work. If you like the idea of taking care of kids and love kids, being an au pair is the best method. The pay is also higher than other kinds of jobs and you also have to be on the call while taking care of kids. Since this job involves taking care of kids, it requires a bit of hard work and dedication. Being an au pair does not mean looking after the kids all the time, on the contrary, au pairs have a fixed time slot similar to that of teachers working in a school. Popular websites include: au pair, au pair world, international au pair exchange and go au pair. This is a more demanding seasonal work since it involves managing, cleaning the rooms, and guiding the guests when they arrive at the hostel. The peak work occurs when there is high tourist inflow to the tourist area. Since the wage is low for these kinds pf work, most people usually trade working for getting a free bed and food. This is a good way to cut the expense and save money on food and accommodation. When you are not spending, you are in turn saving a considerable amount of money. Moreover, the jobs can be of any duration usually, these jobs can last for – days, weeks or even months. It all depends on the worker. The job is also versatile depending upon the needs of the employee. If you are one of those adventurous people, then scuba diving can be fun and entertaining for you. Moreover, if you are passionate about the hobby and want to teach as an instructor. There are dozens of scuba diving spots around the world where they take in scuba diving instructors, both native and foreign. Destinations such as Thailand, Cambodia, Bali and the Honduras are all very good places where you can easily find such work. These types of jobs and their application processes are really informal. Use your present skillset and experience to find a suitable work. These include teaching people dance, music, teaching people how to cut hair, offering them business consultancy, and so on. There are a wide variety of jobs that can be approached to if you have the right skillset and experience. Be creative in your work proposals and try to attract a large number of clients. Sites like craigslist is an example of this. Always keep in mind that where there is a will, there is a way. Destinations having a large tourist flow always have a large number of bars or areas where tourists can relax and drink. These kinds of bars usually have seasonal jobs and are willing to take tourists who have an interest in bartending. The best chances of getting such jobs are in party destinations such as Thailand, South Korea etc. these countries also provide working visas where people like tourists and travelers can work. In the same concept as bartending, waiter staff, busboys and dishwashers are always in demand since people come and go for these kinds of occupation. These jobs are relatively easy to get in backpacking countries and party destinations as well as large cities. Again in countries having working holiday visas, travelers become the backbone of the society and the service economy through such jobs. Volunteer work does not offer you much pay, but they do offer you room and boarding which will guarantee more budget savings for you. Plus, the purpose of doing volunteer work is to do something good, hence it is for a good cause and helps in the development of the society. Do not try to spend a lot of money in organizations that provide you volunteering services by paying a price, that kind of organizations keeps a part of this amount for themselves as a part of their operations. Instead, try to find volunteer work in the destination that you arrive to find more opportunities where the time and availability are the best. Both small scale and local volunteering services can be done in these places. This is where the love of travel really applies to travelers. Using traveling as a source of livelihood is a good method to earn money. This is more of a real job in the tourism industry. It is a fun job, though it can be tiring. The wages are not great, but this job provides to travel and work around the world gaining a lot of experience and an opportunity to meet people from different countries and nationalities. Companies that offer such services are usually, located in the USA, Australia, and New Zealand. These jobs often require a long-term commitment. If you are the kind of tourist that loves the sea and the ocean, then working on a yacht is the best method for earning some money. Yachting jobs are relatively easy to get without much prior experience. Also, it is an easy method to get to see around the world. Positions are usually long term, with the employees getting trained in basic yacht training like tying the knots, handling the sails and such. This is more suitable for travelers who are fit to go on an expedition to the sea. Trading jobs for whatever you could find is also a good method to earn quick money. Trading labor for any kind of job is a good method for hardworking travelers. If you are willing to work a few hours day in exchange for cash, boarding and food, then the opportunities are endless. Craigslist is a good method for finding such jobs. Many of the jobs provided overseas are usually unglamorous and hard to finish. For example: mending the crops or looking after the cattle in farms. Travel blogging is also a great method to earn money and also a good platform to share your experience, views and reviews about the places you have been traveling to. Though the travel blogging industry is really hard and competitive and is usually hard to make money, it is a good method to express your views and be of help to others. Moreover, the amount of hard work and time spent on such blogs are really large and sometimes the results do not pay that much as the work done. Affiliate marketing is a great way to make a large amount of money and that too in a short period of time. Though the competition can be a bit high, it is an efficient method to make some cash for funding the rest of the trip. Moreover, these kinds of jobs offer a steady paycheck and hence can be really useful for a steady source of income. Affiliate marketing involves selling the product with the help of affiliates and their interests. These kinds of jobs require months of research in studying about the product and how well it will sell among people. Those who have an eye for art and who has a decent camera can be a travel photographer. If you have the skills for a professional photographer, then you can easily get a job. Such jobs pay a lot since many magazines and journals tend to buy from such photographers. The competition is very much fierce and tough. Also, instead of selling individual photos another method is posting these pictures on their travel blogs so that more people could see it.